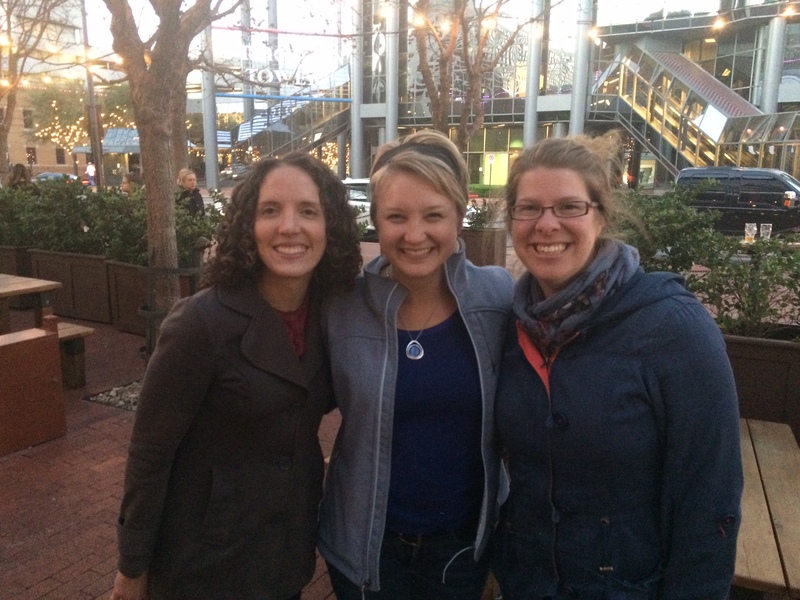 Sarah Mackenzie from the Read Aloud Revival was in Fort Worth this past weekend, speaking at the Great Homeschool Convention. A friend of mine had tickets for a separate meet-up with Sarah on Saturday night and asked me if I’d like to go with her. I was so thrilled, because I’ve been obsessively listening to the RAR podcasts and reading the blog, soaking up all I can about children’s literature and, as Sarah says, “building your family culture around books”. She was such a sweet and charming host to all of us who came to glean more from her. Caroline suddenly became convinced that she needed to begin reading from our collection of unabridged classics. We’ve read several together but she’s never attempted one on her own before and I had planned to have her start with one of the easier ones next year. 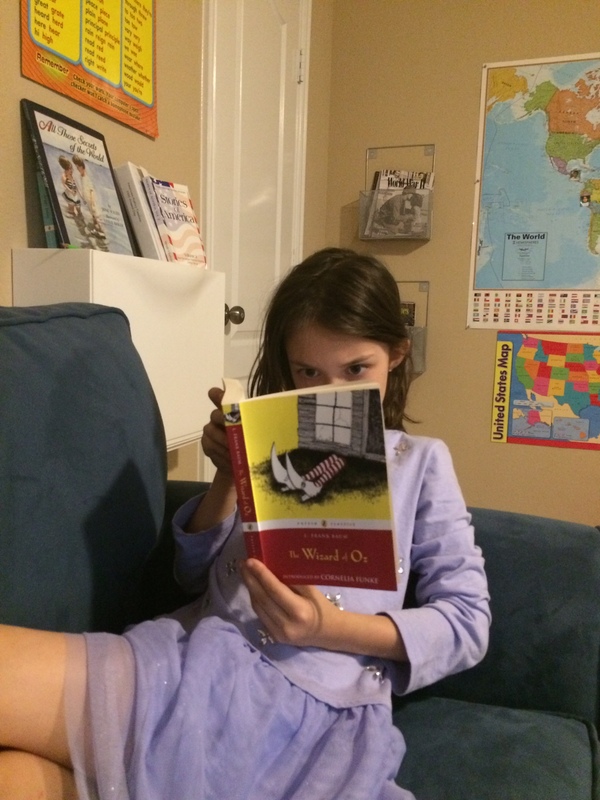 She begged me to let her read Oliver Twist because she recently read an abridged children’s version and loved it, but I talked her into starting with The Wizard of Oz. 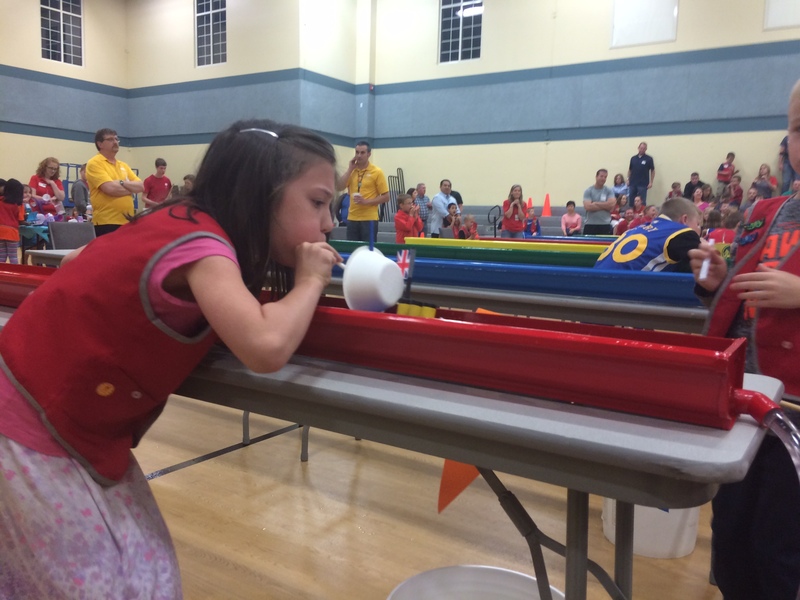 We’ve been participating in the annual Sparks Regatta for several years now, which is an Awana activity for kids in grades K-2. We’ve had plenty of opportunities for trial and error and learning from past mistakes. Last weekend, Caroline participated in her final Regatta before she moves up to Truth and Training in third grade next year. She really wanted to do a Titanic theme, even though Josh warned her they probably couldn’t make a fast Titanic. 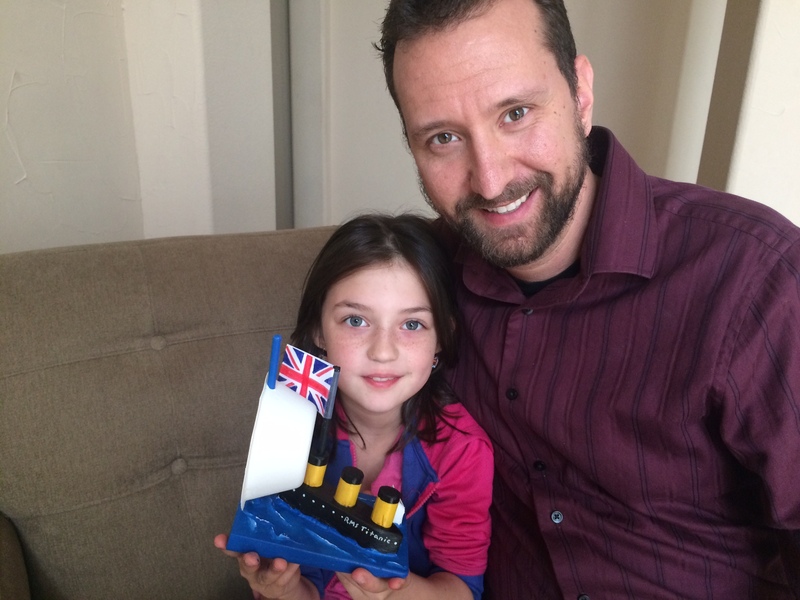 Her response was, “That’s ok. I’m really going for the prize for best design.” So the two of them set out to build the best looking Titanic boat ever. The problem was, when they tested it out in the bathtub, it literally sunk! So after a lot of disappointment, they started over with a new idea that would keep the boat as lightweight as possible. The ship was only a small portion of the overall boat, and the rest was the water. They even included a little iceberg! 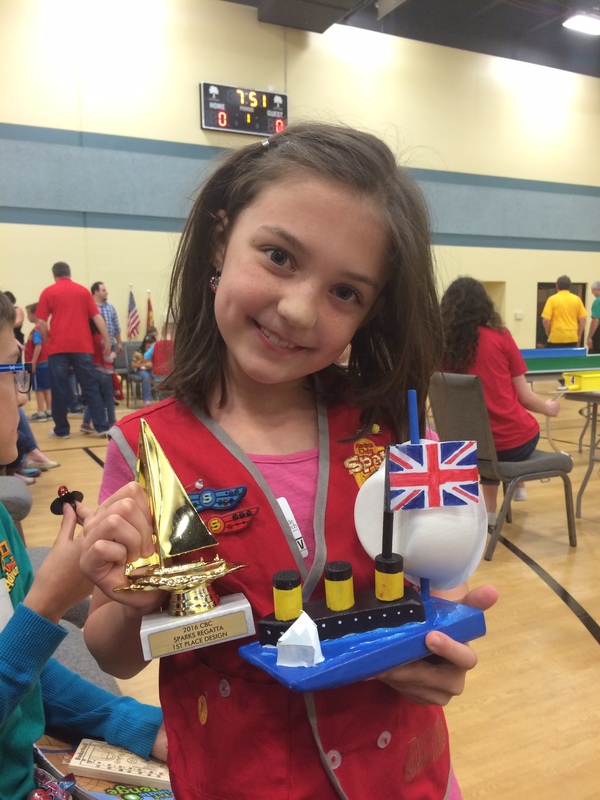 Her boat may not have been one of the fastest, but she accomplished what she set out to do. After becoming inspired to keep reading lots of good books to my kids, I decided to look into how audible works to see if it might be something I’d want to utilize as well. My kids have been listening to audiobooks since they were itty bitty, but we’ve always done it via the cost-free route, which has been getting the CDs from our library. They listen to audiobooks almost every day in their rooms during their quiet afternoon time, and on weekends we allow them to fall asleep listening to them (on weeknights they get thirty minutes of time to read to themselves before going to sleep). There are plenty of book titles that the library doesn’t have though, and sometimes fumbling with several CDs (that are often scratched) isn’t the most convenient thing. There’s nothing more frustrating than making your way through four CDs of a book only to discover the fifth one is damaged and skips. 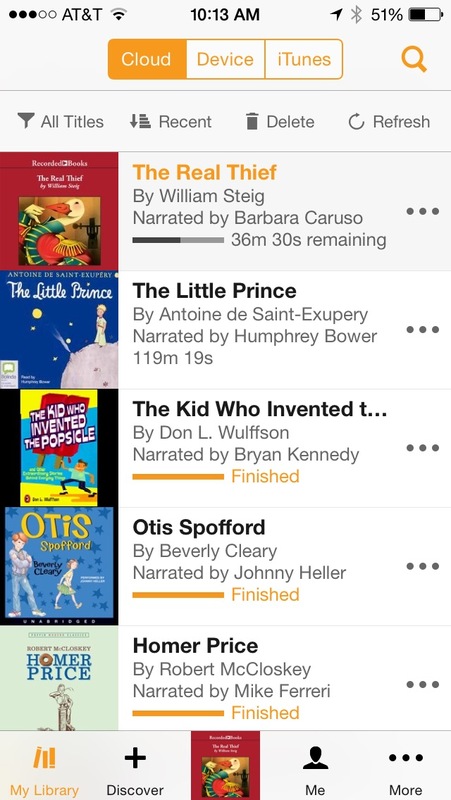 I’ve discovered that audible is a great way to easily get more great books read to my kids. I can download an audiobook and within seconds it can be played anywhere from my phone, our iPad, or the iPod touch that the kids use, which all have the audible app that is logged into my account. It’s amazing how quickly you can get through a book, even if you only listen to it each time you’re in the car. Twenty minutes here and there adds up to a lot of “reading” and I feel like it’s a much better use of our time than just listening to music. Not to mention, nothing guarantees me a nice quiet drive like an audiobook that captivates my children. Now, the downside is that audible is expensive. Some of the books are between $15 and $20, which I normally cannot stomach paying, unless maybe it’s a really long book that would last us for an extended amount of time. To get the best deal, I decided to get an annual membership, which gives me twelve book credits for approximately $12 a piece. I’ll only use those credits for books that cost at least that much. You also have the option to not apply your credits and pay normally, which is what I do with the cheaper book titles, since I don’t want to waste my credits on them. Additionally, audible members get an extra 30% off, so a book that is normally $10 will only cost me $7! Not a bad deal! The “bookmark” feature is very handy. If we’re listening to a book in the car and then one of the kids wants to keep listening on their own in their room, I can mark the spot we stopped at and let the child keep listening and then the rest of us can go back to where we left off when we’re all listening together again. One of my favorite features on audible is the sleep timer. Since these audiobooks don’t come separated into CDs that are timed perfectly for listening to in one “sitting”, I needed a way to make sure my kids didn’t listen to an entire five hour book late into the night. Audible allows you to choose the amount of time you’d like it to play and then it will stop at the end of that time, so we set it to play for one hour at bedtime and I don’t have to remember to go turn it off. You can pick up right where you left off the next time you’re ready to listen.